The record is made up of 1 volume (1952 pages). It was created in 1908. It was written in English and Arabic. The original is part of the British Library: India Office The department of the British Government to which the Government of India reported between 1858 and 1947. The successor to the Court of Directors. Records and Private Papers. where they have 50 houses; there are some also at the village of Dha'aiu. The Hamaidat are Maliki Sunnis and live by pearl diving and fishing. In winter they camp in the interior of the peninsula of Qatar with thei? whom it commemorates neither lived nor died at Hamdan. Baharinah- Their occupations are sea-fishing and pearl-diving. This volume is Volume II of the Gazetteer of the Persian Gulf Historically used by the British to refer to the sea area between the Arabian Peninsula and Iran. Often referred to as The Gulf or the Arabian Gulf. , ’Omān and Central Arabia (Government of India: 1908) compiled by John Gordon Lorimer. The volume is a geographical dictionary with a series of alphabetically arranged articles relating to the physical and political conditions of the Persian Gulf Historically used by the British to refer to the sea area between the Arabian Peninsula and Iran. Often referred to as The Gulf or the Arabian Gulf. and its surrounding areas. Pages i-iv are an 'Introduction' to the volume written by John Gordon Lorimer at Strathmartine, Dundee, on 24 December 1908. Details are given within the introduction concerning the content and arrangement of principal and subordinate articles and explanations of estimates of distance and time and other statistical information. 'Makrān (Coast of Persian)' (pages 1130-1155). All articles have a similar form. 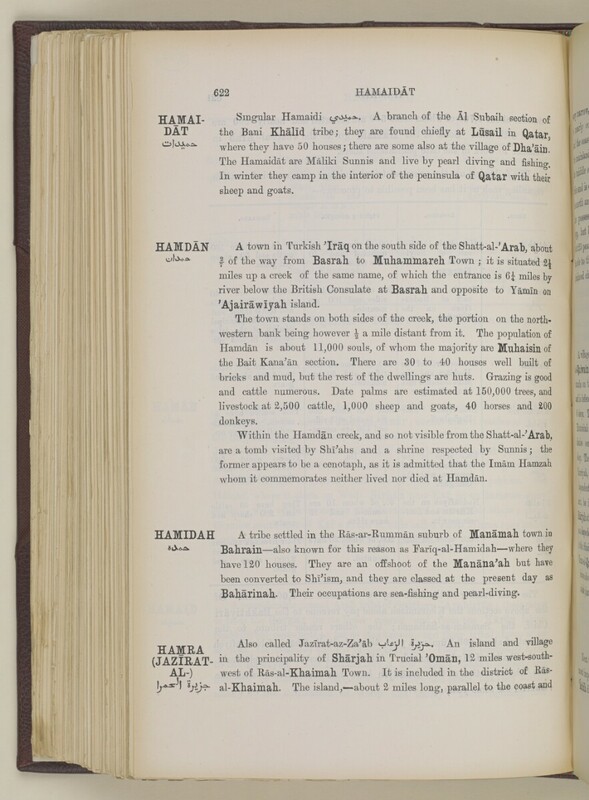 The English and Arabic place or tribe name appears in the right or left margin, followed by the text of the article split into sub-sections and with topographical information arranged in tables. Arabic words are given in the text next to their equivalent transliterated into Latin script, with the transliteration system employed appearing in 'Appendix S' in Volume I, Part II (IOR/L/PS/20/C91/2, pages 2737-2741). Topics of information contained within the articles include: boundaries and sub-divisions; physical character and main features (for example, mountains and rivers); climate and seasons; natural products (vegetable, animal and mineral); agriculture and crops; livestock, including transport animals; inhabitants, with reference to racial and tribal distinctions, religious differences, mode of life, character, language, customs, dress and arms, and estimates of populations; trade (internal and external), with notice to currency, weights and measures, shipping, manufactures and industries, and miscellaneous occupations; communications by land and water, with descriptions of routes and estimates of transport; administration and government, especially police, justice, military resources, taxation and finance, and political constitution; and, international position and foreign interests, especially British and their representation in the country. Lorimer refers readers to the Appendices of Volume I, Part II (IOR/L/PS/20/C91/2, pages 2205-2741) for fuller details concerning: meteorology, health, date cultivation, transport animals and livestock, religions and sects, trade, sailing vessels, fisheries, pearl fisheries, and postal and telegraphic communications. 'The Fort of Wakrah, Qatar'. Photographer: Major Percy Zachariah Cox. Following the title pages and 'Introduction', entries are arranged in alphabetical order from '’Abādilah' to 'Zubair Town'. Foliation: The foliation sequence is circled in pencil in the top right corner of the recto The front of a sheet of paper or leaf, often abbreviated to 'r'. of each folio. It begins on the first folio with text, on number 1, and ends on the last folio with text, on number 1034. It should be noted that f. 192 is followed by f. 192A.